OU University Theatre’s A Christmas Carol. 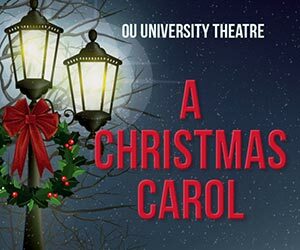 The quintessential Christmas story about second chances, ghostly visits, and the things we can and cannot change returns to OU University Theatre. A new adaptation by director Tom Huston Orr is staged this year, and it’s rich in the history of A Christmas Carol. With poetic dialogue and moving moments for the would-be hero Ebenezer Scrooge, the audience is led into the colorful world of Victorian London and the most wonderful Christmas tale ever told.